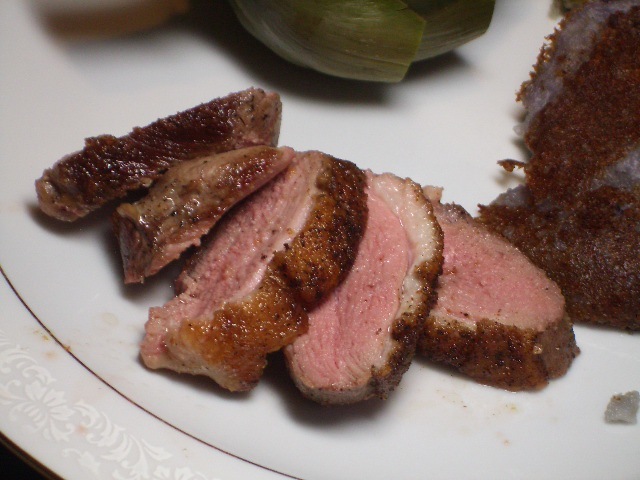 If your duck breast is frozen, thaw it. If it’s in the fridge, set it out for 3o minutes to get it to room temperature. Using a sharp paring knife, score the side with the skin and the fat in a cross-wise pattern. (This will allow the skin to sear and release a lot of that good duck fat). Heat a stainless steel skillet over medium heat. Once hot, add the duck breast, skin-side down. Sear for three minutes, then flip to the other side and cook for another 2-3 minutes. (You want to meat to be rare-medium rare). Remove from heat and let rest for 5 minutes. Slice, serve and ENJOY!